The Glen Club is more than "just" a championship golf club! Our 48,000 square foot Clubhouse has the space for your next corporate event. With two private Boardrooms, the versatile Pickwick Room and a spacious Grand Ballroom, we can accommodate groups from 4 to 230 with style. Full catering services are provided throughout the facility and our dedicated, professional staff is here to attend to all aspects of your event, including room set up, breakouts and audio/visual requirements. We'll work with you to create a flawless and productive business meeting or corporate event. Call us at 847.832.6431 to get started. The Glen Club is also a Boutique Hotel! 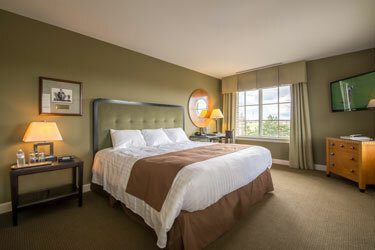 Our 21 upscale hotel guest rooms are perfect for any out-of-town attendees. We are convenient to O'Hare (15 minutes) and downtown Chicago (25 minutes) - a unique alternative to airport or city hotels.